Royal Diary: Mai on FACEBOOK! Hello everyone! I've been planning this for a long time and now, I didn't doubt on making one. 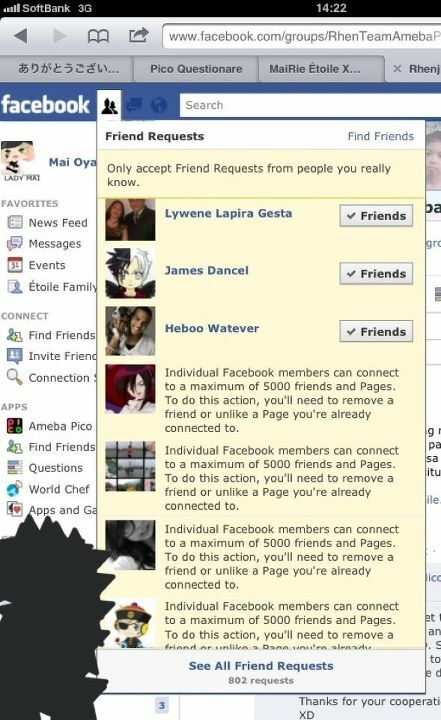 I've been having for a long time, adding other people not just on Pico but also in Facebook. My facebook, facebook.com/MaiRie.Etoile reached total of 5000 friends + likes page the reason wh I'm not accepting other people and it already reached 800+ now! That's why I made a new page, facebook.com/RealMaiRieEtoile for everyone who wants to add me on facebook and to get updated about me. I'm telling everyone that I WILL NOT UPDATE ANYMORE MY FACEBOOK(facebook.com/MaiRie.Etoile) Instead I WILL BE UPDATING MY PAGE (facebook.com/RealMaiRieEtoile) So please like it instead on adding me on facebook. That could help me as well. For those people who added me for a long time, please understand that I can't really accept you anymore :( Please understand.